Newly designed for the adventurous soul and inspired by history’s great explorers; Belmond Savute Elephant Lodge in Botswana’s Okavango Delta reopens its tented-doors in June, inviting guests to explore, discover and connect with its African charms and earthy tones. A private boat trip at sunrise to one of the wildest and lesser-known islands of Filicudi in the Aeolian archipelago, where artists living in caves and islanders share their foodie-and cultural secrets, await guests of Belmond Villa Sant’Andrea in Taormina Mare this season. As a part of a series of extraordinary performances taking place across Belmond’s most inspiring locations, music by London Philharmonic Orchestra will fill the jungle-air on route to Machu Picchu and the banks of Urubamba River in the Sacred Valley with concerts held aboard Belmond Hiram Bingham on 4th April and Belmond Hotel Rio Sagrado on 5th April. A treasure trove of art, antiques and authentic artefacts, Belmond reveals its newly restored and redesigned Mexican masterpiece – Belmond Casa de Sierra Nevada – a unique cluster of historic ‘Casonas’ that form an intrinsic part of street life and the thriving arts and crafts town of San Miguel de Allende. Floating serenely into view this spring are two new barges joining the Belmond Afloat in France fleet that will journey through the culinary regions of Alsace and Champagne, offering itineraries that feature private visits to family-owned vineyards and breweries. Strengthening Belmond’s position as a pioneer of spas on luxury trains, Belmond Andean Explorer’s spa carriage joins the rake in May, offering a host of locally-inspired restorative and healing treatments while meandering through the epic Peruvian Highlands. 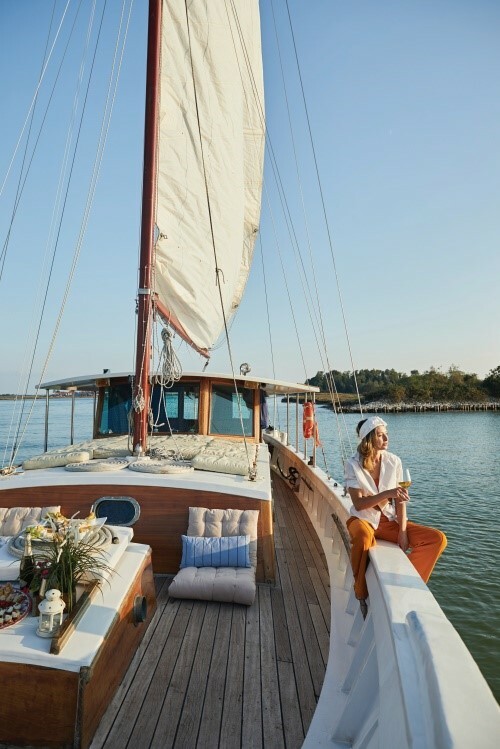 To celebrate the 60th birthday of the Venetian icon Belmond Hotel Cipriani, guests are welcomed aboard the elegant and storied decks of ‘Edipo Re’ – a much-treasured vintage wooden sail boat from the 1960s to sail through the hotel’s nearby lagoon. In November 2018 Belmond will open its flagship Caribbean resort, Belmond Cap Juluca, following a fresh and beautiful redesign that is inspired by nature and the enviable beach views – offering a laid-back luxury escape, where the spirit and soul of this iconic property and island life runs through it. A shining moment in Belmond’s brand story; the eagerly anticipated Belmond Cadogan Hotel throws open its historic front door this winter following a sensitive refurbishment that brings to life the hotel’s intriguing 131–year history and invites global travellers to explore its charming private garden and neighbouring boutiques of Chelsea. Newly designed for the adventurous soul and inspired by his tory’s great explorers; Belmond Savute Elephant Lodge in Botswana’s Okavango Delta reopens its tented-doors in June, inviting guests to explore, discover and connect with its African charms and earthy tones.